This year Frank – A Life in Song celebrates ten years of sell-out performances and rave reviews from audiences and critics around the world. For its tenth anniversary season, Frank comes to the Sydney Opera House for the first time. 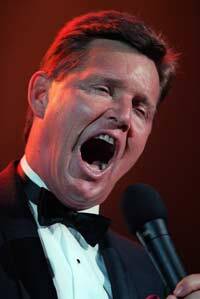 Open your eyes and let the Tom Burlinson take you on a trip from the stage of the Sydney Opera House to New York, Hollywood, the moon and back. 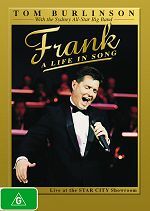 May 2006: Fans can now buy a fabulous dvd featuring a live recording of Toms Frank - A Life in Song concert. It features the entire show - songs and monologue - a full 2 hours. It has great production quality - the film and sound are both fantastic and you feel like you are really there in the theatre. There are some behind the scenes extras and interviews too. Its a must for all Tom fans. You can buy your dvd at www.ezydvd.com.au or at www.middle8.com. Both sell to overseas customers as well - just make sure you have read the info on the FAQ page here about dvd regions. Most aussie dvds will place in US and UK computer dvd drives - even if it wont play in your dvd player. 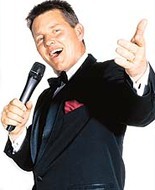 Tom Burlinson, the voice of young Frank in the Golden Globe Award winning ‘Sinatra’, stars in his highly acclaimed hit celebration of the music and career of the late, great Ol’ Blue Eyes. Live in concert at the Star City Show Room in Sydney and accompanied by the fabulous Sydney All-Star Big Band, this DVD features two hours of entertainment with more than 30 classic Sinatra songs. Sydneysiders will be the first to experience the newest incarnation of Tom's Frank Sinatra tribute Frank - More from a Life in Song. Start Spreading the News, he's back with More. More SONGS, More SWING, More SINATRA! All new show. The show opens at the Star City Showroom on May 11 2006 to 4 June 2006. Book your tickets via TICKETMASTER or book VIP or Stay & See packages at SHOWBIZ. For those who can't get to Sydney - have a listen to Tom on the FRANK-A LIFE IN SONG official website. Melissa Kenihan is an award winning audio engineer and she has produced this fantastic double CD from about 30 hours of recordings she made over many rides and visits with the Lovick family. Glenda Lovick quote: "She has really captured the essence of the high country and has made a priceless record of some of the important events in the evolution of the Lovick family and our life in the high country. Some of it is funny, some of it is scary and all of it is downright entertaining. Some of Charlie's yarns are almost believable!" 'High Country Life' comes in a fantastic cover with a beautiful shot of Charlie on Denny on the front and some great pictures of the high country inside. Click on the cd for more information, samples and how to purchase your very own copy - and yes - overseas purchases are available for High Country fans around the world. COMING SOON Man From Snowy River 1 And 2 (EXCLUSIVE Collector's Tin) (2 Disc). Released on 17 November 2005. Both movies in a cute tin display box. October 20 2005: The long awaited DVD release of Phar Lap at last !! Click on the picture to go to ezydvd and buy your special 2 disc set now. 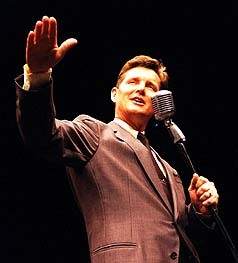 Disc 1 Audio Commentaries:With Director Simon Wincer and Star Tom Burlinson. Disc 2 Vintage Featurettes: the Mighty Conqueror (1931) & Agua Caliente: Phar Lap's Last Race (1932). From The Horse's Mouth: Never before heard converstation between Tommy Woodcock & Simon Wincer. Timeline: The Phar Lap Story. Theatrical Trailers (Australian, US and Australian Teasers). 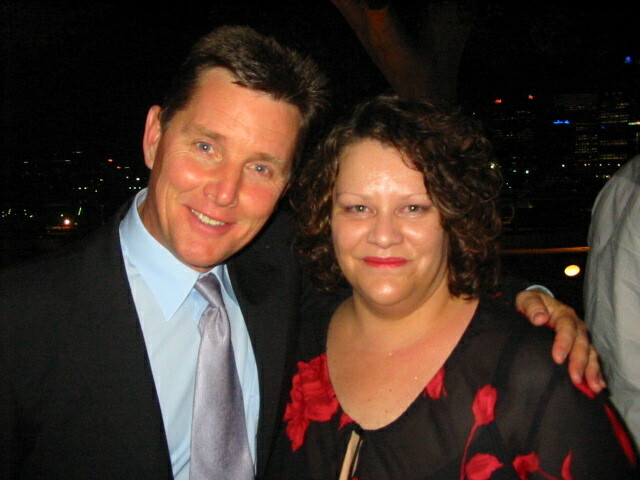 26 May 2005: The Producers opened to a huge celebrity audience (and thats little ole me with Tom at the after party) in Sydney. All the reviews are in the MSN Group. Bookings are going fabulously. March 25 2005: The Producers has opened in Brisbane. I have added articles and reviews to the MSN Group page - just click on the button on the left to find the group. new photos and reviews will also be added to my Producers page - try the other button. February 19 2005: Sydneys previews for The Producers are from 15 - 25 May 2005. Opening night is Thursday 26 May 2005. Visit http://www.lyrictheatre.com.au/ for more info about the Star City Lyric Theatre in Sydney. Click on the Ticketek link on the left - bookings open March 14. It will play there until April 30 2005 before moving to Sydneys Lyric Theatre in mid May. www.showbiz.com.au are selling great stay and see packages for both cities. 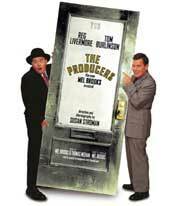 August 28 2004: Great news for fans of The Producers. Seasons in Brisbane and Sydney have been announced for 2005. At this stage the info I have is that it will open in Sydney's Lyric Theatre in mid May after a short Brisbane season. Principals Tom, Reg, Bert and Chloe are confirmed to continue in their roles. More info will be added here as it comes to hand. July 31 2004: www.ezydvd.com.au has multiregion copies of The Time Guardian available now. MAY 23 2004: COMING SOON. Sequel The Man From Snowy River 2 will be released on DVD in Australia on August 5 2004. Featuring the wedding scene that was originally deleted before its cinematic release - this cannot be missed !! Preorder your copy now at www.ezydvd.com,au. APRIL 18 2004: Well last night was opening night of The Producers. Articles and photos have been added here and there are more articles in the MSN Group page. MARCH 2004: THE MAN FROM SNOWY RIVER DVD AUS RELEASE FINALLY !! Finally the news Australian fans have been waiting for. The double dvd is set for release in April. It will have extras that the US release didnt have. Click on the pic below to see EZYDVD's write up. Doesnt look like all contents have been confirmed as yet - but I am excited !! MARCH 2004: THE PRODUCERS opens for previews on April 2nd and the premier is April 16 at the Princess Theatre in Spring Street Melbourne. Fingers crossed for a long season as I still havent bought a ticket !! Enter your email addr in the MSN button and you will recieve an invite to The Producers MSN Discussion Group. SEPT 2003: See Tom in Frank or The Producers !!! Only a couple of weeks left for people to see Frank - A Life in Song at Star City in Sydney - the season ends on October 5th 2003. Then lucky Melbournites can see the show at Melbournes Crown Showroom from 22nd October 2003 to 9th November 2003. Try showbiz.com.au for great stay and see packages. Tom appeared on the Today show this month promoting The Producers. He will star as Leo Bloom along with a great cast featuring Reg Livermore, Bert Newton, Tony Sheldon, Chloe Dallimore and Grand Piro. The Producers will be on at Melbournes Princess Theatre from 17th April 2004 to 24th October 2004.. See showbiz.com.au for ticket packages. I look forward to recieving reviews, photos, stories etc from all who get to see the show. JAN 2003: Several announcements for the start of the year. Firstly, lucky Brisbanites have the chance to see Frank A Life In Song next month. Bookings via QTIX at www.qtix.com.au or 13 62 46. DONT MISS IT ! I thoroughly enjoyed the show and will put a review up soon along with pics from the program. There was also a CD released from the show and it won an ARIA award in 2002.www.hmv.com.au have it in stock. JUNE 2002: Two very exciting events are coming up. Firstly, Tom has announced dates for a series of shows for Frank - A Life In Song in Toronto Canada. Click on the pic to see venue, dates and booking details. I hope many of you will have the chance to see Tom in this fantastic show and I look forward to your reviews and comments. More details a Tom's official site www.TomBurlinson.com.au in the news section. Secondly, for Aussie fans of the movie The Man From Snowy River comes the Arena Spectacular. It is being described as a Musical, a Rock Concert, and a Rodeo. It stars 40 Australian stock horses, Steve Jeffreys - who led 120 horses into the 2000 Olympic Opening Ceremony, Country Music legend Lee Kernaghan, Georgie Parker, Steve Bisley and Bud Tingwell, plus more than 200 actors,stuntmen, dancers, singers, musicians and riders. It will feature the original soundtrack from the movie as well as newly composed music. It will be opening in most capital cities soon so check the official website by clicking on the pic on the left for dates. 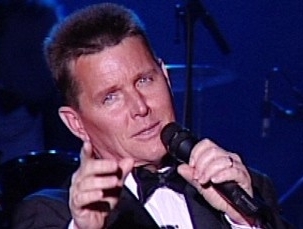 October 22nd 2001 - The launch of the Official Site - visit www.tomburlinson.com.au NOW !!!! October 2001 - Tom plans to be in the US checking out venues for the Frank show. Sept 2001: Click on the pic on the left to go to a recent article on Theatre People . com. August 2001: Frank - The Sinatra Story in Song. See it this month in Sydney. It's on at the Capitol Theater in Haymarket from Friday 24th August to Saturday September 1st 2001. Go to www.ticketmaster7.com for booking details. News from Michele in the US. (August 10 2001). The Man From Snowy River is about to be released on DVD in the US. At long last !!! At this stage I haven't seen any advertising in Australia, tho I assume it would have to be released here very soon for the 20th Anniversary. I will find out more as soon as I can. US residents can buy it at www.amazon.com NOW. Is Tom Taking Frank To The Yanks ?? In a recent article in The Advertiser (April 30 2001) Susan Archdall discovered Tom plans to take his Sinatra tribute to North America later this year. He isn't sure how much the use of the Sinatra name overseas will cost him. It is one of the logistics he is tackling, along with US union laws which will decide how many Australian musicians and dancers he can take with him. Australian copyright laws and the approval of Sinatra's daughter Tina enable Burlinson to use the Sinatra name in Australia. He also sang the role of the young Sinatra in a telemovie made by Tina. Best of luck Tom - I am sure it will be a huge success. And just a hint - I have good reason to believe the show would go down very well in Italy !!!!! Tom and Mandy welcomed baby boy Guy into the world in March 2001. A brother for 2 year old Mia.